Select Credits: Ouisa in Six Degrees of Separation, Claire in Fuddy Meers, Mercy in Greyhounds, Agnes in The Shadow Box, Estelle in No Exit, Queen Catherine in Henry VI, part III, Goneril in King Lear and Olivia in Twelfth Night. Why theater? : I can't help it. Really. I got the performance bug as a kid and just never got over it. I like film and television work but in theater - the live audience, the rehearsal process, the finding new things as you go through a run - that is intoxicating. Who do you play in Trifles and The People? : I play Mrs. Hale in Trifles and The Woman from Idaho in The People. Tell us about Trifles and The People: Both plays were written by Susan Glaspell in 1916-1917. 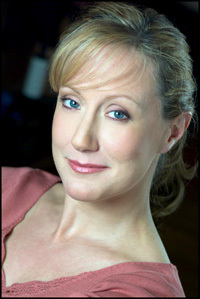 Susan was a journalist and it influenced both plays. Trifles is a murder mystery based on a real life murder and The People is about a journal/newspaper working to raise social consciousness that is on the brink of shutting down. Both plays have two woman characters whose keen observations and willingness to seek the truth drive the plot. Susan Glaspell wrote about abuse, sexism, misogyny and freedom of the Press and these plays subtly address those issues through clever storytelling. What is it like being a part of Visionary Voices? : For me, it is a bit like being in a hurricane. To make this production happen means that I am at the center of fundraising and producing. I love these plays and want to share them with an audience, collaborate with other artists and act - but, it is a challenging balancing act and a huge commitment of time and energy so I can't wait for the sweet spot when we are running and I get to be the actress the majority of the time. What kind of theater speaks to you? What or who inspires you as an artist? : When I think about, talk about, a piece of theater days after I have left the theater -that is what speaks to me. I know that is vague but there isn't a "type" of theater that I love most. It is when a director, an actor/s, a set/sound/lighting designer has created that magic that pulls me in and allows me to see the shared humanity that is familiar or foreign to me. The big and small events that make up our lives...my grandmothers - two very creative woman. Any roles you’re dying to play? : I want to play Goneril in King Lear & Margaret in Henry VI, part 3 -again. What’s your favorite showtune? : "The Rain in Spain" from My Fair Lady. If you could work with anyone you’ve yet to work with, who would it be? : There are so many great theater artists I would love to work with but Cherry Jones, Mark Rylance, Liev Schreiber, Laura Linney, Ruben Santiago-Hudson, Mark Ruffalo, Allison Janney, Lin-Manuel Miranda, Denzel Washington are a few of them. Of course, I am rubbing elbow with Tonya Pinkins right now (she is directing Exit: An Illusion - one of the one acts that make up the evening) and it would be exciting to be on stage with her! Who would play you in a movie about yourself, and what would it be called? : Meryl Steep in "Big Sky." If you could go back in time and see any play or musical you missed, what would it be? : I would love to have seen the original West Side Story. I saw a wonderful production of a Broadway revival a few years ago but to have been in that audience when it first hit the stage... now, that would have given you chills!! What show have you recommended to your friends? : Most recently - Hamilton. What’s your biggest guilty pleasure? : Watching right wing conservatives trip over their alternative facts!! What’s up next? : Planning our spring Corner Stone Reading Series. It was through this series that we unearthed and explored the plays I am currently bringing to the stage. We have been searching out American bards that have has voice in shaping American theater as we know it today - there are so many playwrights and plays that are worth revisiting.